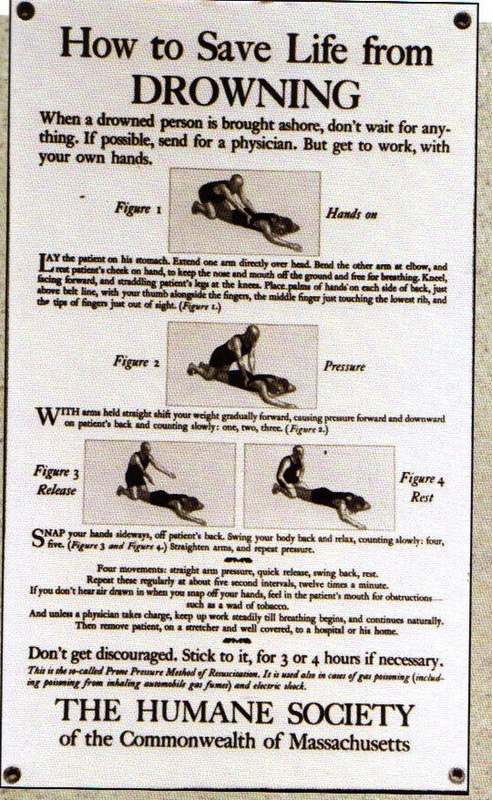 This is a rectangular How To Save a Life porcelain sign. This particular How To Save a Life sign is white with black print. It reads, “How To Save A Life From Drowning, When a drowned person is brought ashore, don’t wait for anything. If possible, send for a physician. But get to work, with your own hands. Don’t get discouraged. Stick to it, for 3 or 4 hours if necessary. The Humane Society of the Commonwealth of Massachusetts”. This sign also features images of the actions described.